Jan. 18 (UPI) — Freezing cold temperatures and heavy snow are expected across the Midwest and Northeast this weekend, weather that canceled hundreds of flights Friday. About 100 million people are under a winter storm watch, warning or advisory. Cities along the Great Lakes are also contending with possible lake effect snow, which could increase their snow totals. Boston and New York City saw light snowfalls. By late Saturday, freezing rain is expected with as many as 6 inches of snow and sleet. By Friday afternoon, more than 11,000 flights in the United States were delayed and 771 were canceled, FlightAware reported. A second round of storms, associated with the same system, is expected to exit the Rocky Mountains and travel to the Midwest later Friday, and points east on Saturday. Kansas City and St. Louis, which both received major snowfall last weekend, expect less accumulation this time — but strong wind gusts and blowing and drifting snow. Milwaukee and Chicago could get up to 9 inches of snow, forecasters said. Snow will begin falling on Chicago Friday evening and increase through the night. Buffalo, which has not yet endured a major snowfall this winter, is expected to see strong winds and snow beginning Saturday. About 6 inches are expected in the metro area, and as many as 16 inches elsewhere in western New York state. 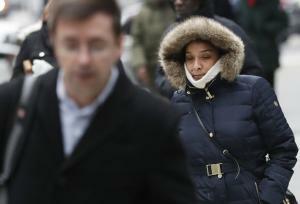 The snow will be followed by extreme cold for the eastern United States. Arctic air is expected to cover the area as far south as Florida, cooling most of the continental United States with below-average temperatures.